The Bird's Robe Collective | Bird’s Robe Records 5th Birthday lineup announcement! Bird’s Robe Records 5th Birthday lineup announcement! We’re turning 5! Well, the label is, BRC has been around 7 and a half years by now. But it seems like as good a time as any to reflect and rejoice at what an amazing journey it has been. 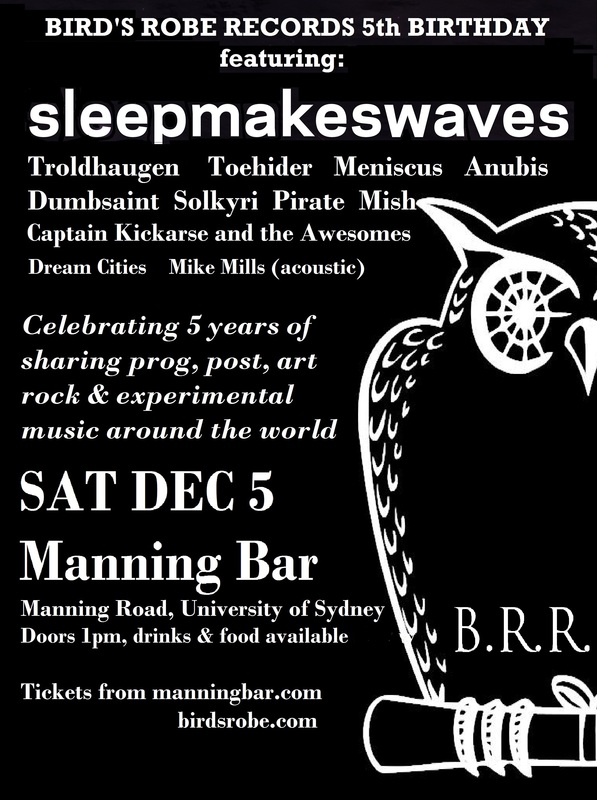 We’re throwing one heck of a party on Sat Dec 5 at Manning Bar in Sydney – hope you can all join us to celebrate. Sydney-based label Bird’s Robe Records is celebrating 5 years with a massive showcase of its local talent on Saturday December 5 at Manning Bar. Home to some of Australia’s finest progressive and experimental artists, the Bird’s Robe party will be headlined by acclaimed instrumental post-rockers SLEEPMAKESWAVES. The two-time ARIA-nominated and outfit have recently wrapped up a 55-date, 22-country tour in support of newest album ‘Love of Cartography’ and will close out their year with an exclusive hometown show before performing at Festival of the Sun. Joining the lineup is experimental metal group TROLDHAUGEN who are riding high after a successful European tour, performing at Summer Breeze festival alongside Opeth and capping off a massive run in support of their second album ‘Obzkure Anekdotez for Maniakal Massez’ including tours with Japanese avant-garde experts Vampillia and pirate-metal legends Alestorm. Melbourne’s TOEHIDER will play their only Australian show of 2015 in a rare home soil appearance, following Mike Mills’ return from Europe performing alongside Dream Theater’s James LaBrie in Ayreon’s ‘The Theatre Equation’ as well as Toehider’s first ever European tour. The shows follow the release of the new EP ‘Mainly Songs About Robots’ featuring legendary Dio drummer Vinny Appice, as well as a massive 2014 which saw the album ‘What Kind of Creature Am I?’ released to worldwide acclaim. Sydney cinematic-rock group MENISCUS return to the stage premiering new material for the first time after recording the follow-up to 2011’s ‘War of Currents’ and touring alongside American shoegaze icons This Will Destroy You and heavy instrumentalists Caspian. Progressive rockers ANUBIS will wrap up a triumphant year, returning home from their first ever international tour, including Germany’s Prog the Castle Festival and club dates in the Netherlands and UK in support of their hugely successful third album ‘Hitchhiking to Byzantium’ which topped sales charts in Germany through distributor Just For Kicks. DUMBSAINT will join the lineup to showcase exceprts from their brand new filmic masterpiece ‘Panorama, in ten pieces.’ The quartet have spent the past few months touring the release of their second album around Australia, the soundtrack to a film written, directed and produced by the band themselves, due out in early 2016. Their rare live appearances have seen them play alongside Boris (JPN), feature at Nicefest alongside The Crooked Fiddle Band and earn ‘Album of the Week’ honours in The Brag. Sydney powerhouse instrumental rock group SOLKYRI will perform straight off the back of supporting indie-stadium legends MEW on their first ever Australian tour. Touring heavily off the back of their second album ‘Sad Boys Club’, the band have also toured alongside US legends …And You Will Know Us By The Trail of Dead and The Red Paintings, headlined their own club shows along the east coast and performed overseas alongside Tangled Thoughts of Leaving at Belgium’s prestigious Dunk! Festival and club shows across the European continent. CAPTAIN KICKARSE AND THE AWESOMES are legends of the Sydney underground. Instrumental in the early success of The Bird’s Robe Collective shows, they returned from hiatus in 2015 with the long-awaited debut album ‘Grim Repercussions’. Catapulting back onto the live circuit, they have played along the east coast including supports for Vampillia and their own headline shows. Their incredible energy coupled with a mix of technical math-rock and groove makes them one of Australia’s most memorable live acts. The emotionally charged prog metal epics of MISH will grace the stage after a busy 2015 recording the follow up to their debut album ‘The Entrance.’ This year they have also played Sydney’s Slaughterfest and previously supported both Russian Circles & Pelican, earning a dedicated fan base amongst the post metal underground. To celebrate 5 years with Bird’s Robe, they also recently released a new video for ‘Precocial’ from their seminal debut. Fledging additions to the Bird’s Robe family are local electronic-prog-jam trio DREAM CITIES. Sporting a healthy penchant for pop melodies laced with fiery instrumental guitar work, the band also combine blue, funk and dance into their unique sound. Finally, what better way to kick things off than with an exclusive acoustic set from Toehider’s MIKE MILLS. Having earned a dedicated following from his exploits with the progressive rock group, as well as in his own right, as a featured performer on Ayreon’s ‘The Theory Of Everything’ and through his stunning pitch-perfect rendition of Kate Bush’s ‘Wuthering Heights’ which has so far racked up half a million views on YouTube. Always unpredictable, always incredible, his solo acoustic sets are a rare treat for anyone to witness. With such a mammoth lineup, this show is set to be a celebration like no other. Doors open at 1pm, music starts from 1.20pm. Early punters will receive a free selection of snacks and drinks provided. The unlikely beginning of Bird’s Robe began back in 2008 when Mike Solo and Alex Tulett found inspiration in their prog-rock group super FLORENCE jam to start collaborating with like-minded musicians in Sydney. Since then, The Bird’s Robe Collective have gone on to promote international tours, taken on management, bookings, publicity and releases for over 50 artists and earned a reputation as an ardent supported of little-heard, but hard-working musicians with an ear for the left of field. 5 years. Who would have thought it’d ever get this far? Having started booking gigs and networking in 2008, by 2010, my fledgling concept of ‘The Bird’s Robe Collective’ had begun to morph into something more than just organizing a few shows. Local acts were starting to band together and express interest in collaborating, and were progressing towards writing more than just a couple tracks for an EP – debut albums were on the horizon. It was exciting. So I made the decision to start a label – and in October, Bird’s Robe Records was launched with our first two releases: ‘Musodynamics’ by The Bird’s Robe Collaboration Band, featuring members of Pirate, Slimey Things, Squid, Fuji Collective and produced by Alex O’Toole from Captain Kickarse and the Awesomes; and ‘Sppears’ by Japanese act Vampillia. It wasn’t long before momentum grew and with our first 12 months we’d released the debut albums from sleepmakeswaves, Pirate, Mish, Toehider, Lander Configurations and new releases from Anubis, Solkyri, Ruins-alone and more. Since then, we’ve clocked up over 50 releases with a roster of 40 acts, including UK legends 65daysofstatic, art-rockers The Red Paintings, Perth experimentalists Tangled Thoughts of Leaving, Sydney’s Dumbsaint and Brisbane prog icons Arcane. Along the way, we have seen so many of these acts reach new heights – touring overseas, supporting major international artists, playing festivals around the world, hitting sales and radio charts and playing to enthusiastic audiences at home and abroad. Not to mention, many ridiculous things, such as 3 ARIA nominations, a Top 40 record and sold out shows in four different continents. Perhaps more than anything however, the greatest achievement is the sense of community around the label and more broadly, the ‘scene’ in Australia and abroad. The whole reason Bird’s Robe started back in 2008 was because there was no scene to speak of, no awareness or support for underground experimental, progressive, instrumental music. The fact that such a thing now exists and people continue to support these artists, makes me incredibly happy. So with that in mind, what better way to celebrate 5 years as a label (and 7 years as a collective) than throwing a massive party-show? With as many Bird’s Robe bands as can fit, in our hometown of Sydney, where it all started. This lineup features some of the acts most dear to my heart – and most instrumental (pun intended) in establishing the scene and label over the past few years. Of course, not all of the acts can be with us, but I’ve done the best I can (with the budget available to me, which is small). This has always been a labour of love – so I would love for you to join us in celebrating these amazing artists and helping share their wonderful music around the world.